In 1986, maintenance engineers at DuPont's Pontchartrain Works in La Place, Louisiana, were faced with what seemed like an impossible task. They needed a sealant caulk that could withstand temperature extremes and extended exposure to ultraviolet sunlight and intense Louisiana humidity, and would bond to concrete, retain its mechanical properties up to 450 degrees F and be highly resistant to chemicals, both acids and alkali. The task proved not so impossible after all. Pelseal sealant, manufactured by Pelseal® Technologies, fit the bill perfectly. Pelseal is made from DuPont's VITON® fluoroelastomer. "It's amazing how resilient the caulk is after years of exposure to Louisiana sun," says Ron Duhon, production specialist in the PPDA unit at Pontchartrain Works. The caulk search began when maintenance engineers noticed cracks that had appeared in the walls and floors of containment dikes built around three tank farms. The plant produces an intermediate melt product, paraphenylenediamine (PPDA), used to manufacture DuPont KEVLAR® aramid fibers. The dike walls are constructed of reinforced concrete. Owing to temperature differences in winter and summer, the walls move approximately 0.8 inches per 100 feet of wall, which caused the cracks. The integrity of the dike area is critical to the environment-conscious plant. The dikes form an extra line of defense against a chemical spill or leak from the tanks. If such a leak would occur, the dikes would contain the spill, preventing potential environmental contamination and costly cleanup. The first method of sealing the cracks – a urethane membrane covered by red shale brick – proved ineffective. So engineers searched for an effective caulk. Most products on the market, notes Duhon, didn't form a good bond with the concrete, deteriorated in the sunlight and had poor chemical resistance. In addition to aniline resistance, the caulk also had to be resistant to the caustic solutions used to clean the concrete. 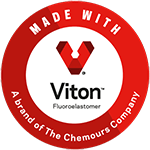 VITON® was considered as an alternative, says Duhon, because "we've found that a VITON gasket material was the best gasket we had used in the process pipelines. No other material had good enough resistance to the aniline." The Pelseal caulk, manufactured by, Pelseal® Technologies, is a two-part fluoroelastomer caulk that is black. 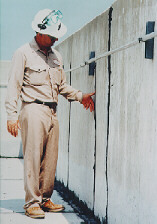 It was first applied in 1986 on an experimental basis and then specified for all cracks in the dike walls and floors. The caulk "exhibited the best qualities of all the sealants we tried," said Duhon. "It formed a tough adherent bond with the concrete, which we needed because these walls undergo continuous contraction and expansion. It resisted exposure to sunlight and other ultraviolet radiation and it seems to be highly resistant to aniline."